Some of you noticed pink is not my favourite colour - I use it in my projects, but it is not as popular as shades of blue, purple, brown or black - of course! But as all of us I have my moods and I like to change things from time to time...and bring a little more of the girly style on, especially if I'm going to work with such a dreamy, romantic photo like the one below! 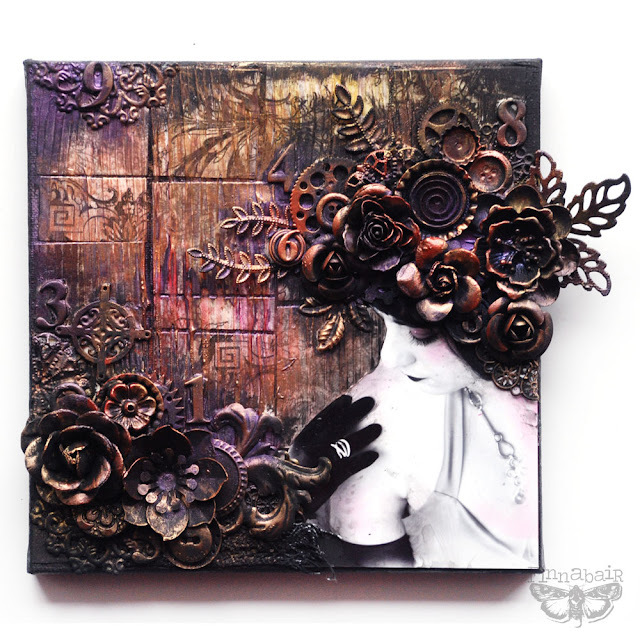 This project was made during "Daydreamer" class and as you can see - it is almost all about pinks, golds, purples and oranges. 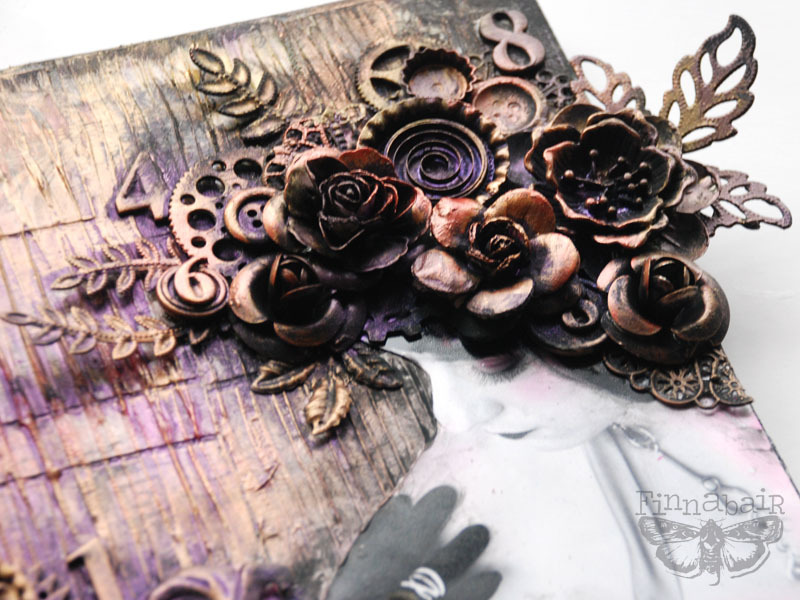 I think it goes perfectly with all the roses (even though they are metal ones! ), poppies and leaves. I love the cold vs warm tones in pinks and purples here - this effect was made using different tones of sprays - shimmer which is inside has different colour tones, which are clearly visible on Art Basics Black Heavy Gesso! 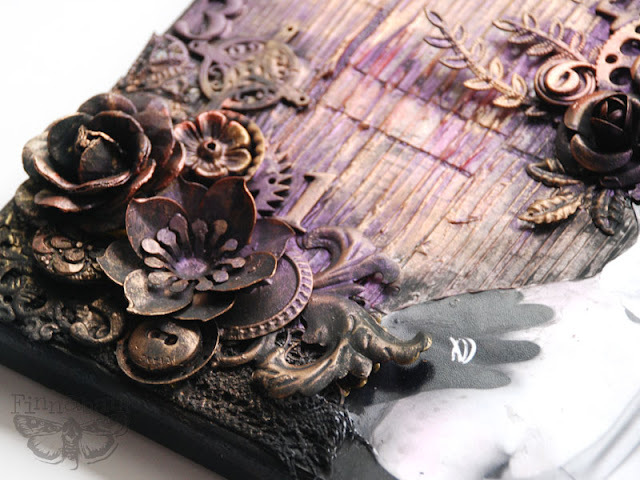 The real depth and eye-catching colour comes from Art Alchemy Metallique paints - I used shades of gold, orange, and purple here - and I adore how they add the vibrancy and depth to the project. 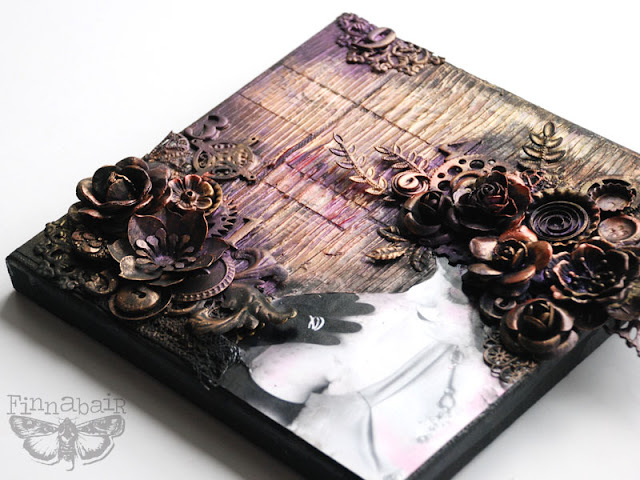 Layered on Art Basics 3D Gloss Gel combed with texture tools and a selection of embellishments - my Mechanicals and Prima flowers they look absolutely stunning. Small and handy format of the collage (it is 8x8'' - which equals to 20x20 cm) makes it a perfect gift size - easy to put on the wall, sideboard, shelf or fireplace... and the set of the techniques you are trying in this class can be easily transferred to any other mixed-media project, or almost every surface! How cool is that? I hope you enjoyed - and I wish you a wonderful, creative week! I just love hair with all of the metals. It gives her strength and beauty. And then only you are the one who knows exactly what colors to put together. Perfecto! Absolutely love this - pink, but not overpoweringly pink. Even w/ all the metal still feels very dainty. Its beautiful and I love the store. I was just wondering if you ever do online classes and if so where do I find them. I live in CA so can't take any of your classes in person although I would love to be able to. What is Finn up to... in September and October?